A twittering bird, tiny of frame but weighty of mind always won battles that defied her puny physical stature. She would often flap her wings by the window of my childhood and delight me with her sharp wit. I related so well to Tuntuni, the little bird. Perhaps because I was petite and shy myself, but not as dim as some of my teachers thought me to be. Tuntuni’s tales filled up the phantasmic canvas around me with magical hues. The thin book carrying records of her victories, complete with bright images that lent credence to the words, became my good friend. All those years ago, I didn’t know who created adorable Tuntuni. Her presence was enough to make my heart soar. All these years later, little Tuntuni still smiles through my window. And it’s time to thank her creator, too. In a sense, Upendrakishore Raychowdhury (U Ray) was the first children’s writer in Bengali. This gifted writer and block-making expert devoted a large chunk of his writing life to creating fascinating stories for children. Before him, there was no established form of Bengali children’s literature. Most of the stories children heard were mythological or religious tales recounted by grandparents. These would almost always carry moral messages and examples. U Ray blazed a new trail by writing stories for kids that were pure fun, replete with strokes of humor, fantasy, and idiomatic peculiarities. This pioneering writer didn’t just limit his children’s writing basket to Tuntuni’s stories. He rewrote the two Indian epics of Ramayana and Mahabharata to bring them closer to children. The simple language he used for these was in keeping with the tradition of elders telling bedtime stories to children. 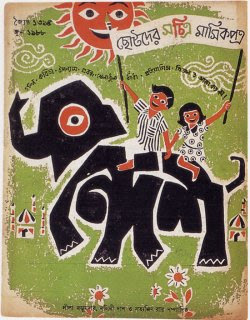 In 1913, U Ray started Sandesh (the name of a traditional Bengali sweet), a children’s magazine. The magazine, filled with his writings and illustrations became a hit with young people and remained that way through generations as his illustrious son, Sukumar Ray and grandson Satyajit Ray managed its affairs after his death. I grew up devouring Sandesh month after month and thoroughly enjoyed the stories, poems, quizzes, along with the scientific and cultural facts the magazine packed within its pages. Tuntuni has remained with me even through my growing years as have other stories of U Ray, one of them (Goopi Gayen, Bagha Bayen) having been immortalized by Satyajit Ray on the silver screen. Smart and witty Tuntuni will come greeting you soon. Keep an eye on that window of yours. As usual, your posts are always so interesting! For those of us on the other side of the world, they are enlightening windows into lives that are not so much different from our own. How lovely!Children are eager for guides and morals, but don’t like them stuffed down their throat.A little bit of sugar helps the medicine go down! – and indicates a change from a rigid, authoritarian approach. Will certainly wait by my window 🙂 You are really fortunate to have had Tuntuni constantly visiting during your childhood. You transmit the joyfulness beautifully. Ray looks a little like Prince with a beard! Georganna, glad you enjoyed the post. In the end, we are more similar than different, aren’t we?Bernita, you put it so well, as usual. Rigid moralizing never works well with children. That’s why U Ray’s stories remain appealing through generations of young readers. Cesar, rest assured, little Tuntuni will not disappoint you. :-)Frank, I haven’t read the stories of Thornton Burgess, but will be sure to look for them at the Gutenberg site. Glad to bring nice memories back. :)Scott, LOLOL. So true, Lindsay. The best of children's writers, no matter where they are from, just know how to bond with a child heart–entering it playfully and remaining there long after the child has grown up.